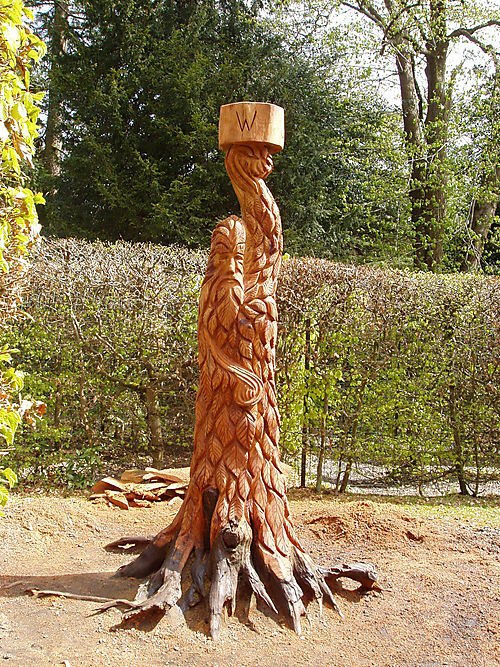 C. CHAINSAW SCULPTURES FOR SCHOOLS/PUBLIC PLACES: 'Greenman', Tatton Park Maze, Cheshire. 'Greenman', Tatton Park Maze, Cheshire. This 'Greenman' has been chainsaw carved from a stump of a cedar tree in the centre of the Maze in Tatton Park gardens . The wood is in very good condition considering the tree was taken down about twenty years ago. Having had a number of coats of Danish Oil it should last a very long time. I had a look around the Tatton Park gardens for influences that I could quickly incorporate in the 'Greenman' in the time allowed. The plinth on the top has the four corners of the compass correctly marked upon it - Lord Egerton was a great traveller and no doubt found a compass helpful. Some may say the 'Greenman' may have a slight look of King Canute about his face - relevant to the proximity of Knutsford. He is looking towards a nearby tree which is, so I understand, the same Cedar species. There are 244 leaves on the tree - which is the number of steps it takes to get from the Maze entrance to the tree! On a personal note - I think this tree has real spirit, maybe it is his eyes. I feel he is a bringer of luck and good fortune. If you carefully walk exactly 244 paces to stop in front of him, and then hold your palm on him for four minutes and four seconds, while you make a wish, then hopefully some of his resilience, character and spirit will rub off on you - and your wish might be granted!